These small bowls are excellent additions to any household. 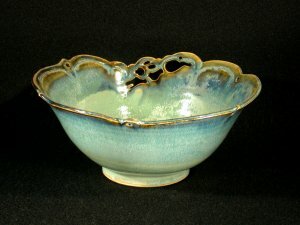 They are lovely accent pieces, plus they serve as unique candy or nut bowls for your coffee or card table. I make many different patterns, using abstract designs I have created. I trace them onto the bowl then, carefully cut out these designs. To finish the pieces I carve the rims to accent the patterns. I choose water, flowers, leaves, animals, fish or flying insects such as butterflies. Sometimes I simply use a free form design. My glazes are all originals and layered for deep variable colors. 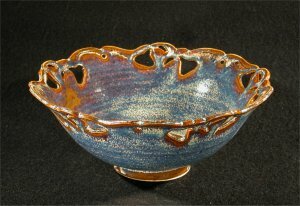 I use high fire stoneware which is quite durable and dish washer safe. Butterflies are a wonder of the warm seasons. 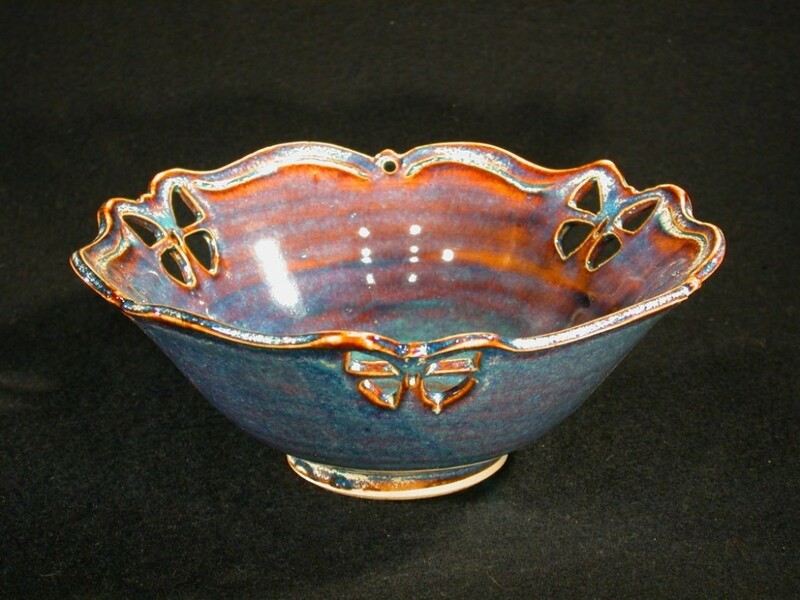 This bowl has three butterflies pierced into the upper sides, with the rim curved to accent them. It comes in two sizes: 6” diameter @ $48 and 8” diameter @$68. 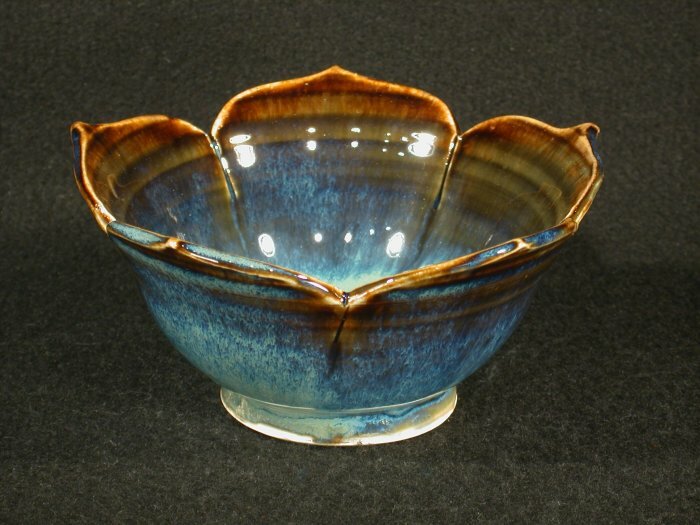 There are several colors to choose from: lavender, aqua blue with a dark blue rim(shown here), sea green with a dark blue rim, desert sand, and variegated brown. Lavender is show here. This is a sweet little bowl. Three pairs of candy kisses circles the small bowl. Price is 6″ diameter size is $48, 8″ diameter size is $68. You can order in your choice of several colors. Lavender (shown here) aqua blue with a dark blue rim, sea green with a dark blue rim, desert sand, or variegated brown. It takes me about 6 weeks to complete an order. Rabbits appear in early spring and can be seen hopping around our yards throughout the summer and fall. I designed this fellow springing from the top of the bowl downward. He is alone on the bowl but the shape of the rim accents his flight. 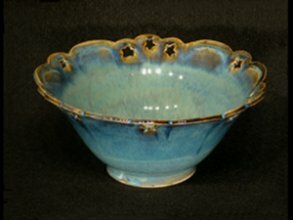 Several different colors: Sea green with a bluish rim, aqua blue with a darker blue rim, lavender, variegated brown or desert sand. 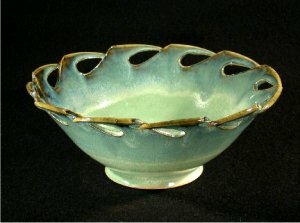 This striking bowl is pierced on the rim, plus the edge is cut through and wrapped around to the back, suggesting ocean waves. One color: sea green with the dark blue rim.